Vitiligo, characterised by white patches on the skin, is a skin disorder which is caused due to the destruction of melanin producing melanocytes cells. Although Vitiligo is not life threatening and non infectious, the social stigma associated with the disease makes it hard to live with. Vitiligo starts as a small white patch and gradually spreads to other parts of the body. In some cases they can spread out to the whole body at a fast rate. The spread and extent of the disorder varies with type and from one person to other. They can occur on different parts of the body like arms, feet, face, scalp and so on. Ayurveda offers effective treatment for Vitiligo by limiting its spread and reducing the area of the white patches. Vitiligo is named as kilasa in Ayurveda. They are classified into three varieties as paithika, vathika and kabhaja based on the imbalance caused by the three doshas, pitta, vata and kabha respectively. Ayurvedic treatment of Vitiligo at the early stages of the disease can help in limiting its growth and eliminating the colour difference effectively. If it is left untreated for long, the effectiveness of the treatment decreases and the duration required to bring it under control can increase considerably. Vitiligo is an auto immune disease where the immune system turns against its own body cells, mistaking them for foreign bodies and effectively killing these cells. Ayurveda describes these conditions to be caused due to intake of food with opposite combination, high mental stress and so on. 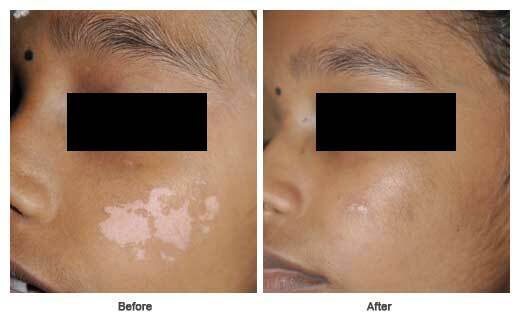 Ayurvedic treatment performed under the guidance of a skilled physician can bring about magical changes in Vitiligo patients. The ayurvedic treatment procedures involve herbal medications, topical medications and other techniques to purify the blood and body from toxins. The ayurvedic remedy for Vitiligo focuses on treating the cause rather than the symptoms. They involve a methodology to enable repigmentation while ensuring that all possibilities for its recurrence are removed. The treatment techniques are free of any side effects unlike modern medicine. Dr. R. S. Roy is a pioneer in Ayurveda offering effective ayurvedic treatment for Vitiligo in Kerala through Amrita Ayurvedic Medical Centre, a leading Ayurveda Dermatology Hospital, dealing with all skin disorders.